Prepare yourself to bid an emotional farewell to the treasured Bake Off foursome as the last ever BBC episode of The Great British Bake Off will be airing on Christmas day. Here is a peek of what is to come in the official trailer for the festive special. 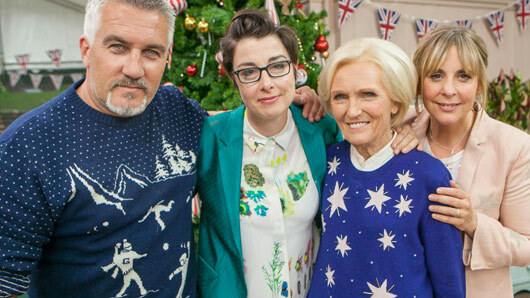 Never will a Christmas Special feel as bittersweet as this one as we watch our favourite baking television hosts come together for one last time before the programme makes its move to Channel 4. Earlier this year, Mary Berry, Sue Perkins and Mel Giedroyc announced their departure from the show after deciding to remain loyal to the BBC broadcaster. Much to the devastation of Bake Off fans everywhere, only Paul Hollywood chose to follow the job over to Channel 4. However, in order to retain some festive cheer the famous four will be returning for a two-part instalment on Christmas day. So at least we can keep ourselves in denial about the split until the New Year. With the all the baking innuendos, cooking calamities and Bake Off charm we could hope for, this final episode is definitely not one to miss this holiday. So, make sure you tune in on Christmas day for the two-part special!